Clock wheels and gears are a work of art. Once upon a service call on a Ridgway modern grandfather clock. The customer stated the clock would stop at 12:30. Initially on the phone was a little puzzling. Upon arrival, noticed the problem right away. The seconds indicator hand was rubbing on the hour hand. This condition only comes in contact with each other when the hour hand would be pointing at the "12". Here are 3 images of this condition. As you can see the hands are touching. Another interesting note is the beauty of the hands in relation to themselves and the clock face. Wm. L. Gilbert model Altai circa 1874 Here we have a nice Wm. L. Gilbert time & strike parlor clock. If your a historian and looking for a little more information about the Wm. Gilbert Clock Company, follow this link. This clock needed a lot of work. The good thing about this everything it needed was easily done. Below is the clock as it was delivered. 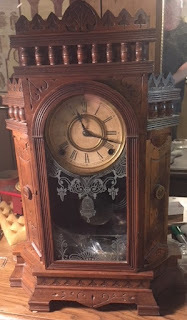 The case was dusty and it looked like the clock has not had some TLC in a very long time. Examination: The next step is to remove the hands, face, and movement from the case. Very dirty on the inside and a significant amount of wear throughout the movement.